January 21, 2019- World Championship Snowmobile Derby, Eagle River. March 11, 2018- Official photoshoot with Pham Photography Group in Long Beach, CA. March 10, 2018- Official interview with Scott Stewart for What’s Up Orange County at the Queen Mary in Long Beach, CA. 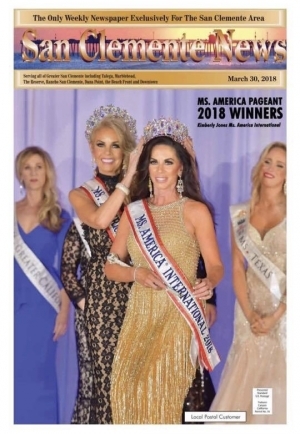 March 10, 2018- Crowned Ms. America 2018 at the Queen Mary in Long, Beach, CA. December 18, 2018 Featured in the She Rocks the Crown spotlight @sherocksthecrown on Instagram. November 27, 2018 Giving Tuesday Ambassador for Active Minds, Washington D.C.
November 4, 2018 Judge at America’s Yankee Miss Pageant. August 11, 2018 Visit to El Chato Ranch Ecological Reserve, Santa Cruz, Galápagos Islands, Ecuador and meeting of the famed Giant Tortoises! August 9, 2018 Meet and great with “Wheelchair Man,” an Afghan-American paralyzed from bombing in his home country who became a U.S. citizen, and is now a “super hero” and author. June 26, 2018 Private visit to Liria Palace, personal current home of the Duke of Alba, and tour of his art and rare document collection in Madrid, Spain. June 23, 2018 Personal guest of Spanish Chef, Pilar LaTorre, at private dinner in Madrid, Spain. April 30, 2018 NAMI 7th Annual Western Massachusetts Art Show featuring the work of artists living with mental illness. April 22, 2018 Appearance at “Mindful: Exploring Art Through Mental Health” at the Fuller Craft Museum Exhibit. April 21, 2018 Ms. International 2018 tour of Providence, RI by La Gondola. April 19, 2018 Ms. International 2018 tour of Boston, MA by historian, Peter Brennan. April 18, 2018 Guest of The Quell Foundation at the screening of “Lift the Mask: Portraits of Life with Mental Illness” documentary film. April 17, 2018 Appearance at Newport Daffodil Days Festival. April 8, 2018 Official Ms. International 2018 makeup tutorial by Yuko Takahashi, makeup artist for Miss USA and Miss Universe since 2003. March 30, 2018 - Featured on the cover of Ladera Ranch News Newspaper. March 30, 2018 - Featured in The Newport News, Society Scene. March 29, 2018 - Featured on the cover of The Coto de Caza Newspaper. March 25, 2018 - Judge for Miss New England 2018 Pageant. March 23, 2018 - Conference with Carin Levin, COO Active Minds, the leading nonprofit empowering students to speak openly about mental health in order to educate others and encourage help-seeking. March 23, 2018 - Featured on the cover of International Face Magazine and interviewed by founder. March 22, 2018 - Featured in Canadian Business Tribune and US World News. March 20, 2018 - Article in Houston Chronicle subsequently picked up by various Texas newspapers. 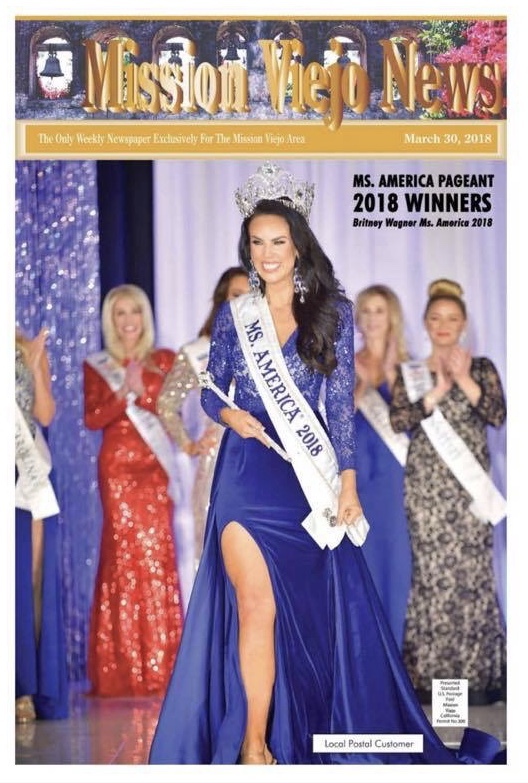 March 20, 2018 - Official press release Ms. International 2018 and Ms. America International 2018 by Bennett Unlimited PR 2018 at Daily Telescope and KMOV St. Louis. March 19, 2018 - Ms. International 2018 Press Release at Yahoo Finance, New York Business Journal, IANS INDIA, Daily Herald (Chicago, IL), Boston Herald (Boston, MA), KUAM-TV NBC-8 /CBS-11 (Hagatna, GUAM), Dallas Business Journal, Penticton Herald (Penticton, BC CANADA), Atlanta Business Chronicle, KFMB 100.7 FM (San Diego, CA), Philadelphia Business Journal, KITV-TV ABC (Honolulu, HI), San Francisco Business Times, EDGE Los Angeles (Los Angeles, CA), WBRC-TV FOX-6 (Birmingham, AL), NBC-3 (Louisville, KY), Manhattan week, Tampa Bay Business Journal, SiliconValleyGlobe.com, WWBT-TV NBC-12 (Richmond, VA), KVVU-TV FOX-5 (Las Vegas, NV), Silicon Valley/San Jose Business Journal, Chicago Business News, Morning News (Florence, SC), San Antonio Business Journal, FOX-19 (Cincinnati, OH), Sacramento Business Journal, WMC-TV NBC-5 (Memphis, TN), Portland Business Journal, WAVE-TV WAFB CBS-9 (Baton Rouge, LA), Orlando Business Journal, Nashville Business Journal, Houston Business Journal, KFMB-TV CBS-8 (San Diego, CA), Denver Business Journal, Telemundo Amarillo (Amarillo, TX), Dayton Business Journal, Austin Business Journal, WVUE-TV FOX-8 (New Orleans, LA), New Mexico Business Weekly, Business Review (Albany), Morningstar, ADVFN, PR Newswire, Pittsburgh Post-Gazette, News OK Oklahoman, WBBH-TV NBC-2 (Fort Myers, FL), WISTV-TV NBC-10 (Columbia, SC), KMOV-TV CBS-4 (St. Louis, MO), WCSC-TV CBS-5 (Charleston, SC), Minnesota/St. Paul Business Journal, KPTV-TV FOX-12 (Beaverton, OR), KHNL-TV NBC-8 (Honolulu, HI), Market Watch (Dow Jones), WBTV-TV CBS-3 (Charlotte, NC), WFMZ-TV IND-69 (Allentown, PA), KOTV-TV CBS-6 (Tulsa, OK), Wichita Business Journal, KWTV-TV CBS-9 (Oklahoma City, OK), Washington Business Journal, KCTV-TV CBS-5 (Kansas City, MO), 4-traders, KOLD-TV CBS-13 (Tucson, AZ), WLOX-TV ABC-13 (Biloxi, MS), St. Louis Business Journal, WAFF-TV NBC-48 (Huntsville, AL), Puget Sound Business Journal, South Florida Business Journal, WXIX-TV, Pacific Business News, 96.9-FM Rock FM (Lubbock, TX), Benzinga, WSFA-TV NBC-12 (Montgomery, AL), KSLA-TV CBS-12 (Shreveport, LA), WTOL-TV CBS-11 (Toledo, OH), WRAL-TV CBS-5 (Raleigh, NC), Pittsburgh Business Times, Business Journal of Phoenix, Triangle Business Journal, Townhall Finance, Tamar Securities, Rockford Register Star (Rockford, IL), Value Investing News, Rockford Register Star (Rockford, IL), Value Investing News, Daily Penny Alerts, Benefit Plans Administrative Services, 1st Discount Brokerage, KHQ-TV NBC-6 (Spokane, WA, WMBF-TV NBC-32 (Myrtle Beach, SC), WECT-TV NBC-6 (Wilmington, NC), WFIE-TV NBC-14 (Evansville, IN), Ticker Technologies, WLBT-TV NBC-3 (Jackson, MS), WALB-TV NBC-10 (Albany, GA), KLTV-TV ABC-7 (Tyler, TX), KAIT ABC-8 (Jonesboro, AR), WBOC-TV CBS-16 (Salisbury, MD), Business Journal of Greater Milwaukee, US Press Association, KFDA-TV CBS-10 (Amarillo, TX), Memphis Business Journal, WOIO-TV CBS-19 (Cleveland, OH), Business First of Louisville, Los Angeles Business from biz journals, Kansas City Business Journal, Jacksonville Business Journal, KAKE-TV ABC (Wichita, KS), KPLC-TV NBC-7 (Lake Charles-Lafayette, LA), KFVS-TV CBS-12 (Cape Girardeau, MO), Boston Business Journal, WTOC-TV CBS-11 (Savannah, GA), WDAM-TV NBC-7 (Hattiesburg-Laurel, MS), One News Page Global Edition, WRCB-TV NBC-3 (Chattanooga, TN), WFMJ-TV NBC-21 (Youngstown, OH), KTVN-TV CBS-2 (Reno, NV), KCBD-TV NBC-11 (Lubbock, TX), WVIR-TV NBC-29 (Charlottesville, VA), KXXV-TV ABC-25 (Waco, TX), WTVM-TV ABC-9 (Columbus, GA), KRGV-TV ABC-5 (Weslaco, TX), KAVU-TV ABC-25 (Victoria, TX), Business First of Columbus, Cincinnati Business Courier, Charlotte Business Journal, Business First of Buffalo, Birmingham Business Journal, Baltimore Business Journal, Company Spotlight, KTRE-TV ABC-9 (Lufkin, TX), WZVN-TV ABC-7 (Fort Myers, FL), WICU-TV NBC-12 / WSEE-TV CBS-35 (Erie, PA), Digital Media Online, Inc., WSIL-TV ABC-3 (Carterville, IL), WAND-TV NBC-17 (Decatur, IL), KWES-TV NBC-9 (Midland, TX), KULR-TV NBC-8 (Billings, MT), KOAM-TV CBS-7 (Pittsburg, KS), myMotherLode.com (Sonora, CA), News Blaze, WFLX-TV FOX-29 (West Palm Beach, FL), RFD-TV (Nashville, TN), Business Journal Greater Triad Area, Your Hometown Lima Stations (Lima, OH), WLNE-TV ABC-6 (Providence, RI), WICZ-TV FOX-40 (Binghamton, NY), KAUZ-TV CBS-6 (Wichita Falls, TX), KNDO-TV NBC / KNDU-TV NBC (Kennewick, WA), The Chronicle Journal (Thunder Bay, ON), KSWO-TV ABC-7 (Lawton, OK), KEYC-TV CBS-12 / FOX-12 (Mankato, MN), WFXG-TV FOX-54 (Augusta, GA), Pontik US, Julie's Home Parties Blog, Axcess News, 360WiseNews, WNKY-TV NBC-40 / CBS-40 (Bowling Green, KY), KVPH-TV FOX-29 (Lake Charles, LA), WBCB-TV CW-21 (Youngstown, OH), WLWC-TV CW-28 (Providence, RI), Our Good Life, Telemundo Lubbock (Lubbock, TX), SWX Right Now (Spokane, WA), Telemundo-20 (Midland, TX), SNJ Today (Millville, NJ), Profit Quotes, One News Page Unites States Edition, Oldies 97.7 FM (Lubbock, TX), NOTICIAS ETX (Tyler, TX), Newspaper Girl, KNBN-TV NBC-21 (Rapid City, SD), KMYL-TV MyLubbock-TV (Lubbock, TX), KXTQ-FM 106.5 Magic (Lubbock, TX), KLCW-TV Lubbock CW (Lubbock, TX), WHDF-TV The Valley's CW (Huntsville, AL), Latin Business Today, TYKFBB-TV ABC-8 / FOX-TV (Great Falls, MT), KASA-TV, Fat Pitch Financials, PRET.FM, My Silly Little Gang, Money Savvy Living, Winslow, Evans & Crocker, Pettinga Financial, Kelowna Daily Courier (Kelowna, BC), KV-5 (HonolulMIR-TV NBC (Palm Desert, CA), KLKN-TV ABC-8 (Lincoln, NE), KFVE-TV MyNetworkTu, HI), Wall Street Select, CRWE World, Cori’s Cozy Corner, Company News, Wapakoneta Daily News (Wapakoneta, OH), Valley City Times-Record (Valley City, ND), The Post and Mail (Columbia City, IN), The Pilot News (Plymouth, IN), The Evening Leader (St. Mary’s, OH), The Antlers American (Antlers, OK), Sweetwater Reporter (Sweetwater, TX), Starkville Daily News (Starkville, MS), The Daily Press (St. Mary’s, PA), Ridgway Record (Ridgway, PA), Big Spring Herald (Big Spring, TX), The Saline Courier (Benton, AR), The Morning News (Blackfoot, ID), BUSINESS CLASS NEWS, AssignmentEditor.com, A Rain of Thought, The Punxsutawney Spirit (Punxsutawney, PA), Poteau Daily News (Poteau, OK), The Observer News Enterprise (Newton, NC), Minster Community Post (Minster, OH), Mammoth Times (Mammoth Lakes, CA), Malvern Daily Record (Malvern, AR), The Kane Republican (Kane, PA), Inyo Register (Bishop, CA), The Deer Park Tribune (Deer Park, WA), Decatur Daily Democrat (Decatur, IN), Daily Times Leader (West Point, MS), Borger News Herald (Borger, TX), Juniata County Radio, KJTV-TV FOX-34 (Lubbock, TX), WBOC-TV FOX-21 (SaTelemundo-2 (Albuquerque, NM), KFJX-TV FOX-14 (Pittsburg, KS), KTTU-FM 97.3 Double T (Lubbock, TX), Washington Psychiatric Society, Warren and Hunterdon Counties City Room (Warren County, NJ), Los Angeles City Room (Los Angeles, CA), Long Beach City Room (Long Beach, CA), April Noelle - Finding Favor, KJTV-AM 950 / KJTV-FM 100.7 (Lubbock, TX), KTMF-TV / KWYB-TV (Missoula, MT), KLBB-FM 93.7 The Eagle (Lubbock, TX), KFMB 760-AM (San Diego, CA), El Paso City Room (El Paso, TX), KLZK-FM 107.7 YES FM (Lubbock, TX), US Press Association, IBTN9 US, KQCW-TV CW-12/19 (Tulsa, OK), Senior Psychiatrists, and Ready...Set...Parenthood! March 15, 2018 - Official press release inclusion in Ms. America 2018 release by Bennett Unlimited PR at International Business Times, Press-Telegram, Pittsburgh Post-Gazette, Star Tribune, Hawaii News, The CW WBCB, Journal Sentinel, 100.7KFM San Diego, Hawaii News Now KFVE, Palm Spring News KMIR, Fox 12 Oregon, TheAmericanBarber.tv, 9 WAFB Baton Rouge, WBRC Fox 6 News Birmingham, NBC 29 Charlottesville, Tucson News Now, AM760, CBS8 San Diego. March 11, 2018 – Official photoshoot with Pham Photography Group in Long Beach, CA. March 10, 2018 – Official interview with Scott Stewart for What’s Up Orange County at the Queen Mary in Long Beach, CA. 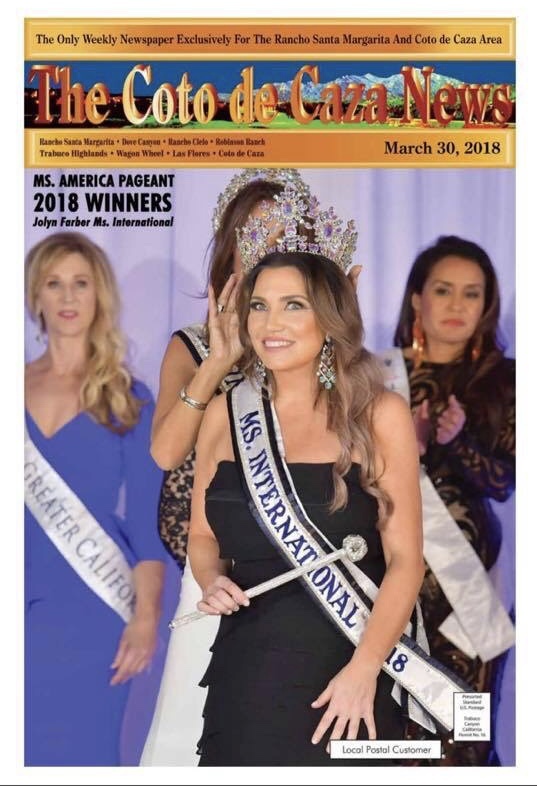 March 10, 2018 – Crowned Ms. International 2018 at the Queen Mary in Long, Beach, CA. December 28, 2016 - official press release: Ms. America 2017 Oksana Vovk attends Laguna Niguel Holiday Parade! July 12, 2017—Judge at Premier World Pageant—Finals with after pageant party. July 7, 2017—Featured in Pageantry and PromTime Magazine under Celebrity Spotlight. July 4, 2017 – Attend July 4th festivities in Cedar City, Utah wearing Bling It apparel. 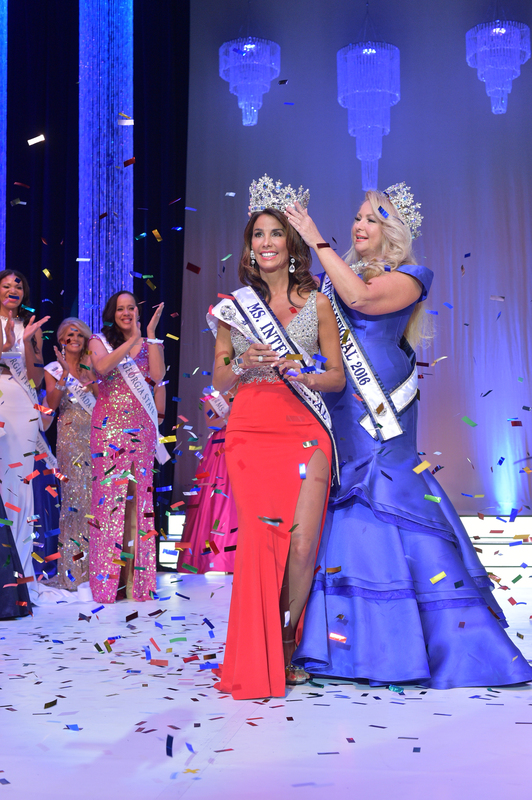 July 2, 2017 – Attend Miss NV, AZ, CA Globe United States Crowning Ceremony. June 10, 2017 – Attend the Mrs. And Ms. Earth Pageant in Las Vegas, NV. March 11, 2017 – Attend WORCS Series Race at Havasu, AZ, wearing my Bling It tee. January 20, 2017—Received Letter of Recognition from the Pageant Help Hall of Fame. January 18, 2017-- Judges Orientation of the America Pageant system. December 17, 2016 – Donate to the Just One Foundation children for Christmas. December 15, 2016 -- Donate blood at United Blood Services. Las Vegas, NV. December 14, 2016 – Receive Letter of Commendation from Mayor Andy Hafen. December 3, 2016 – Work at Santa’s Workshop for the Just One Foundation. December 3, 2016 – Donate clothing items and support Pole Cats Fitness and Safe House Foundation. November 5, 2016 – Ride in the Mesquite, NV, Veteran’s Day Parade. November 4, 2016 – Model Elementz Jewelry at the Lily, Bellagio. Las Vegas, NV. October 20, 2016 – Volunteer at the JBJ Soul Kitchen in Red Bank, NJ. October 18, 2016 – Carlos Bakery In Hoboken, NJ. October 16, 2016 – Live Interview with PageantryNow on YouNow. October 14, 2016 –Just One Project Masquerade Gala. 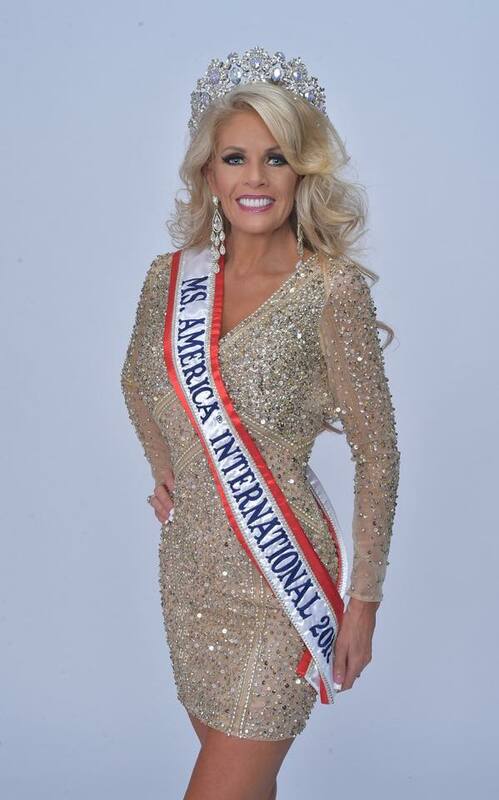 October 14, 2016 – Luncheon with CEO and director for Ms. America, Susan Jeske. October 14, 2016 – LA workout session with celebrity trainer and P90X Instructor, Tony Lattimore. October 13, 2016 – Meet and greet with the office staff of Dr. Erich Herber, DDS. Temecula, CA. October 5, 2016 – Meeting with celebrity dress designer, Debbie Carroll. Las Vegas, NV. October 4, 2016 – Spotlight by the American Association of Legal Nurse Consultants Membership News. September 30, 2016 – Spotlight by PageantryNow. September 27, 2016 – Turn for the Judges: Announcement of Ms. America 2017 Queens. September 21, 2016 – Appearance at the Neon Themed Party at the Hard Rock Hotel in Las Vegas, NV, with Yvette Auger celebrating the release of the Bliss Babe Magazine. September 21, 2016 – Meeting with Mayor Allan Litman, of Mesquite, NV. September 21, 2016 – Interview with Mesquite Local News regarding crowning of Ms. America International 2017. September 17, 2016 - Guest on The Pulse 107.7 WPTL Radio Show, Half Hour to Health, with Dr. Stephanie Mills, regarding Concussion Awareness Day. September 17, 2016 - Interview with Paul Harasim, of the Las Vegas Review Journal, on Elder Neglect and Abuse in Nevada's Nursing Homes. September 15, 2016 - Guest at the San Gennaro Feast, in North Las Vegas, with Tony Sacca and Mayor John Lee. September 14, 2016 - Appearance at Bottiglia Cucina Enoteca, with Yvette Auger, of the Cosmopolitan Connection. September 7, 2016 – Las Vegas.Net: Article covering the crowning of Ms. America International 2017. September 7, 2016 - Las Vegas Review Journal covered the crowning of Ms. America International 2017. September 7, 2016 - Moapa Valley Progress covered the crowning of Ms. America International 2017. September 5, 2016 - Today.com updated story with Ms. America International 2017 crowning. September 4, 2016 – Official photoshoot with Pham Photography Group in Anaheim, CA. September 3, 2016 - Interview with Scott Stewart of What’s Up Orange County. September 3, 2016 – Crowned as Ms. America International 2017 at the Curtis Theatre in Brea, CA.